We are involved in offering exclusive range of Metallic Handmade Paper. Offered products are fabricated by using top quality raw material and high-end tools and technology at our end. Accessible products are made-up in harmony with set industry standards. Products offered are known for longer shelf life and tear resistance. Combination of shree & ganesh on orange color metallic sheet. 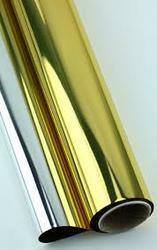 Metallic Paper are made of superior quality raw materials. Our products are designed in such a way to have fine and silky finishing. we offer a wide range of metallic silver paper. These are used for various in industrial and commercial purposes like making paper bags and wrapping gift items. These are widely demanded for dimensional accuracy, durable finish standard and water resistant finish. Offered at industry leading prices, these are further offered in customized solutions. 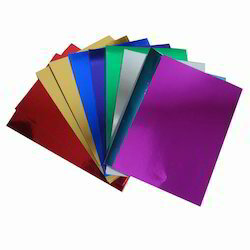 We are offering wide range of metal papers. They can be put to multiple uses and the intensely hued range of colors gives an eye catching look. They are available in various grit sizes to suit hand polishing applications as well.